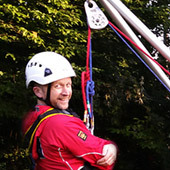 The Larkin frame is a new addition to MCRO's equipment and has been provided by the government funding through Mountain Rescue England & Wales. The Larkin frame will be extremely useful at the top of pitches for deviating ropes over edges or at the side of quarry edges. The 2015 Conference was jointly hosted by MCRO and GCRG in the Forest of Dean. The Saturday saw the 150+ delegates taking part in a number of workshops and practical sessions, followed by an excellent underground evening party in Clearwell Caves. 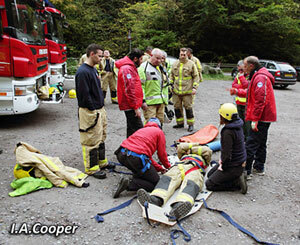 On the Sunday a rescue practice and training session was held in Old Ham mine - this involved rescue team members from around the country plus some from overseas teams! Several team members attended the British Cave Rescue Council pre-AGM Technical day at Buxton Fire Station and the BCRC AGM the following day. Delegates to the Technical day were brought up to date on Legal issues, SARCALL, development of the new Nicola radios, and the BCRC website amongst other things. Team members from MCRO and GCRG joined together for the annual training day at Total Access (UK) Limited's training centre, Eccleshall facilities. Members were divided into groups of 4 lead by team wardens and co-ordinators, then rotated round 8 different training exercises/workshops. By working in small groups all team members were able to familiarise themselves with the various techniques and equipment used in the workshops and the day proved very successful. 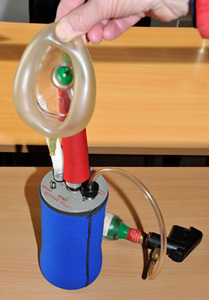 Image: The Little Dragon - a device designed to re-warm a cold casualty by allowing them to breath warm air. The subject of one of the workshops.